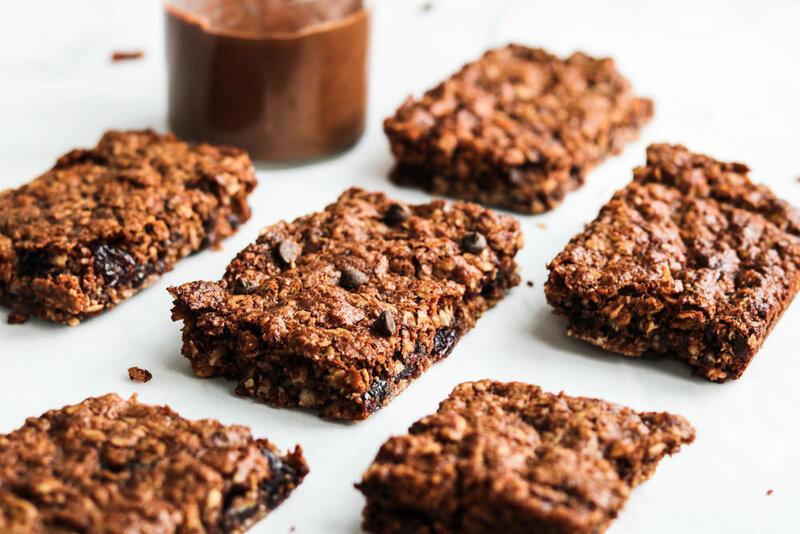 These Vegan “Nutella” Granola Bars are crunchy on the outside and chewy on the inside. They’re made with only 5 ingredients and made in one-bowl but so rich and delicious! Plus they make for a tasty afternoon snack that you can make ahead of time & take with you on the go. I LOVE granola bars. Mainly because it’s basically granola but way easier to eat when on the go and to bring around with me as a snack. These are by far my favourite chocolate granola bars because well, it has chocolate hazelnut spread!! Nutella used to be my tahini back when I was a kid. It starts off with just 5 simple ingredients: vegan nutella/chocolate hazlelnut spread, oats, dried cherries, chocolate chips and maple syrup. Feel free to sub the dried cherries with your favourite dried fruit! Then the mixture goes into an 8x8 lined baking pan and is placed in the oven for 25 minutes. 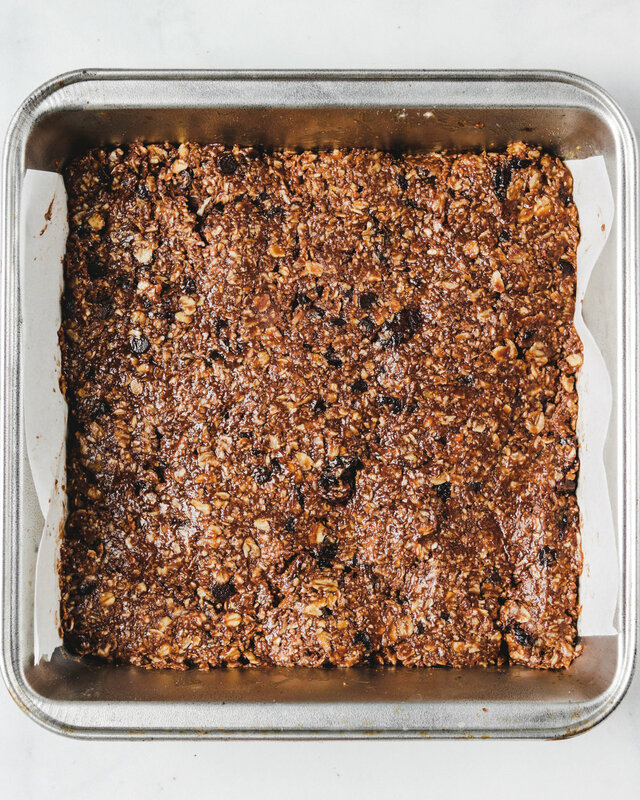 Let it cool and cut them up into granola bars! Yup it’s seriously that easy 😛. Look at how crispy AND chewy they look! Those are key textures I look for in good granola bars. Alright, have I convinced you to make these yet? LET’S GET BAKIN’!! Increasing baking time by 2-3 minutes will yield crunchier granola bars whereas decreasing it by 2-3 minutes will yield more chewy granola bars. Need more on-the-go snack chocolate filled recipes? Check out my One-Bowl Tahini Chocolate Chip Muffins and my Chocolate Espresso Granola recipe! 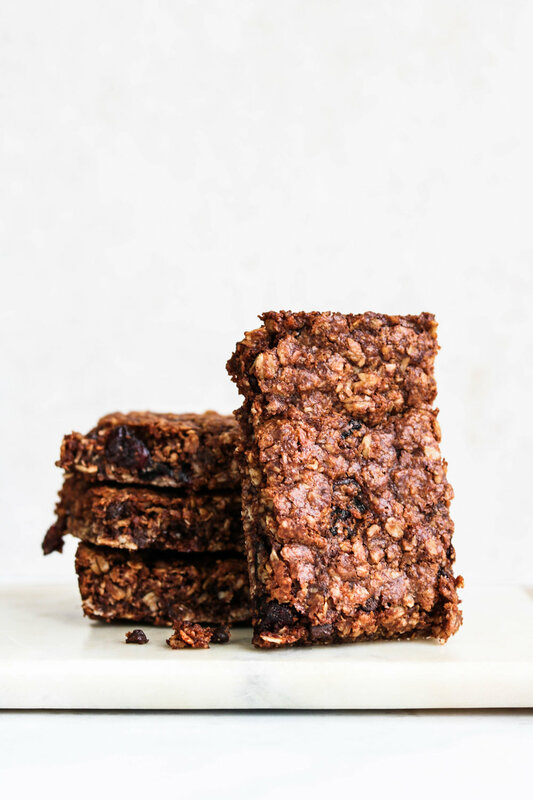 If you make these decadent vegan nutella granoa bars please share it and let me know what you think by tagging me on Instagram @lisakitahara, I love seeing all of your tasty recreations!